In a large bowl, combine the cake mix, eggs, water and oil. Beat on low speed for 30 seconds. Beat on medium for 2 minutes. Pour into two greased and floured 9-in. round baking pans. Bake at 350° for 25-30 minutes or until a toothpick inserted near the center comes out clean. Cool for 10 minutes; remove from pans to wire racks. For filling, in a large saucepan, combine the sugar, cornstarch and salt. Stir in water and juice until smooth. Cook and stir over medium-high heat until thickened and bubbly. Reduce heat to low; cook and stir for 2 minutes longer. Remove from the heat. Stir a small amount of hot filling into egg yolks; return all to the pan, stirring constantly. Bring to a gentle boil; cook and stir for 2 minutes. Remove from the heat; gently stir in butter and lemon peel. Cool completely. Cut each cake horizontally into two layers. Place bottom layer on an ovenproof serving plate; spread with a third of the filling. Repeat layers twice. Top with remaining cake layer. Spread meringue over top and sides. 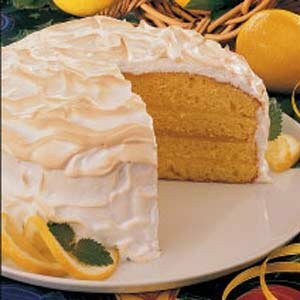 Bake at 350° for 10-15 minutes or until meringue is lightly browned. Cool. Store in the refrigerator. Makes 12-14 servings.